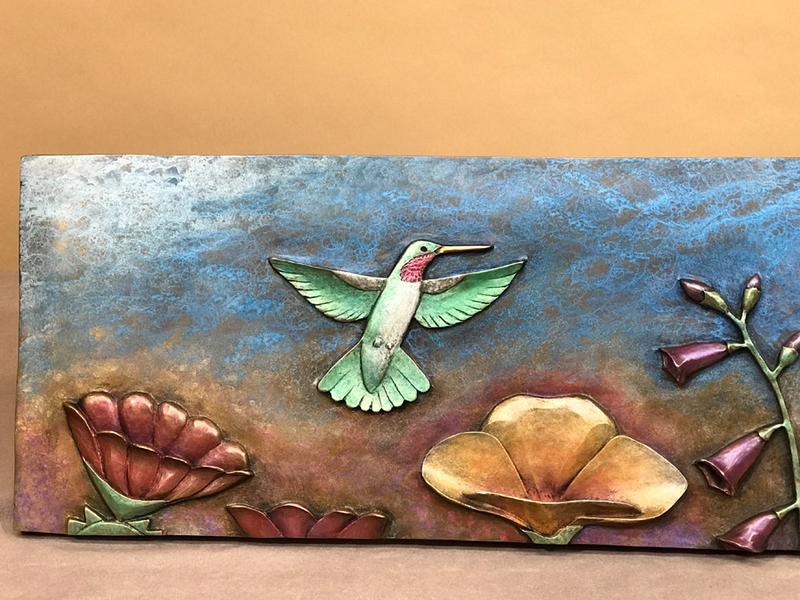 With this piece I wanted to take the sculpting of a plaque to the next level of realism and really try to create a sense of depth with the images coming out toward the viewer. 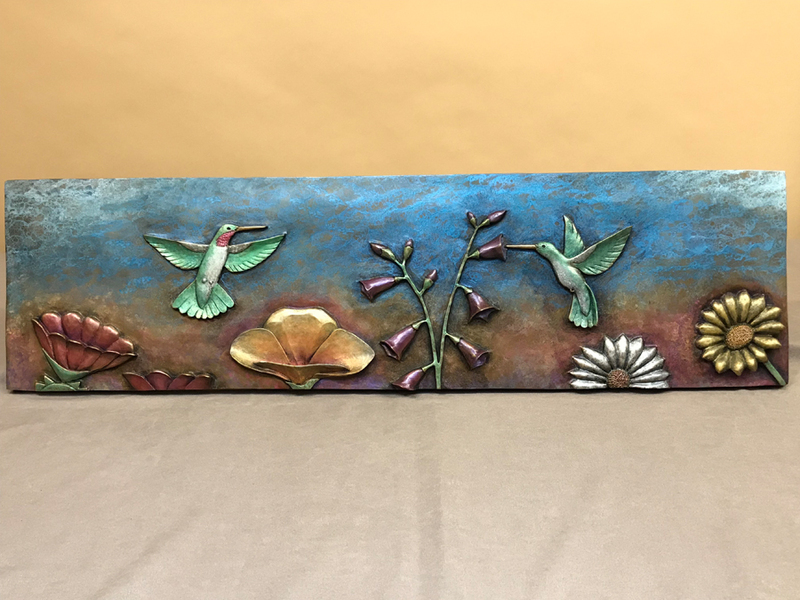 The patina colors really enhance the sense of depth of the piece and really make it come to Life. I looked up flowers of the Southwest and chose flowers that work well with their different color variations. Starting on the left are two flowers (one flower you only see the tips of) they are from the desert cactus. The next flower is called the Golden Poppy. The flower that the female Hummingbird is feeding on is called a Firecracker Penstemon. Then below the female Hummingbird is a White Daisy and lastly, a Sunflower in the right corner. For the background we first buffed out the metal to a golden finish, we want the piece to have a nice glow underneath the patina. 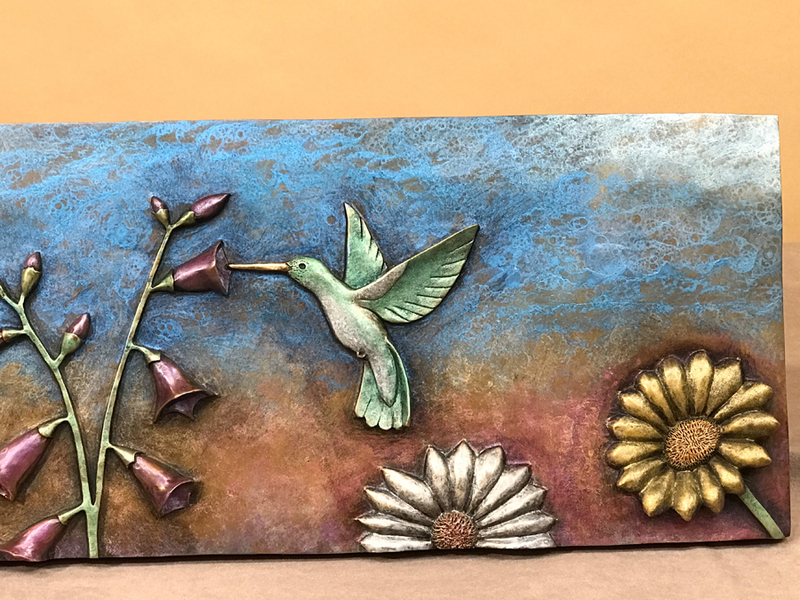 The patina colors around the flowers represent blurred out flowers of different colors, suggesting a field of flowers in the background. Then as the colors move up they transition into a light blue sky with white drifting clouds. I would also like to try a patina that is of a Setting Sun background, however, I’m not sure if these colors will work because of all the colors that will already be present in the flowers. So, we’ll just have to wait and see if that will all work out when we are creating the patinas. I’m hopeful that we’ll be able to present two different patinas for this plaque.